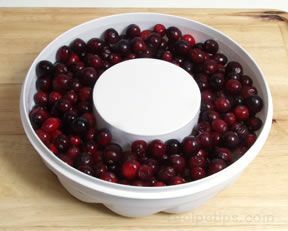 Combine water and cranberries in a large pot. Bring to a boil. Reduce heat and simmer for 45 minutes. Stir in freshly squeezed orange and lemon juice. Add remaining ingredients, stir. Cover and allow to steep for 1 hour. Strain tea, reheat to serve. Serve hot. Garnish with cinnamon sticks and orange slices if desired. Steep: To leave an item, such as a tea bag, to soak in water that has just been boiled. The purpose is to add flavor to the liquid. Try this simple spritzer for a non-alcohol alternative for your holiday get together. 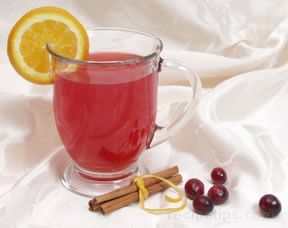 Combine equal parts cranberry juice, white grape juice, and sparkling mineral (fizz) water into a punch bowl. Add an ice ring (see directions below) to keep the spritzer chilled. In a small saucepan, bring sugar and water to a boil. Stir constantly until sugar has dissolved. Cool to room temperature. Refrigerate until chilled (approximately 2 hours). In punch bowl, combine grape juice, peach liqueur, wine, and cooled sugar and water mixture. Add an ice ring to the punch bowl to keep wine chilled (see directions below). 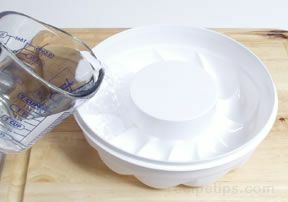 Fill 4 cup ring mold with 3/4 inch of water; freeze. 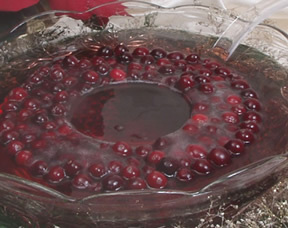 Arrange the fresh cranberries on the layer of ice. 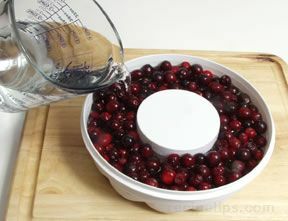 Fill with water and freeze until solid, approximately 6 hours. Briefly dip the bottom of the mold in warm water to loosen the ice ring. 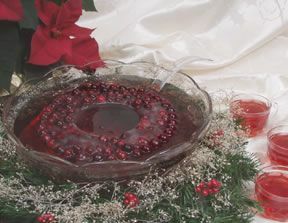 The ice ring should slip out of the mold and can then be added to the punch bowl with your holiday punch. Quickly chill wine and champagne by placing the bottle in a bucket of ice water rather than in the freezer. Leave in ice water approximately 10 minutes. To decant bottle-aged wine easily, insert an unbleached coffee filter into the neck of a glass pitcher and pour the wine into it. Fill wine glasses slightly less than half full, allowing room enough for wine to breath. A half bottle of wine per guest is an appropriate estimate when entertaining for up to 2 hours, this approximation is dependent on the drinking tendencies of your guests. Always have non-alcohol drinks available. Turkey and ham are traditional food choices for the holidays. Turkey is a challenging food to pair with wine because of the oily quality and that it has both light and dark meat, think fruity and tart. Ham is a challenge because of the saltiness of the meat, think fruity not dry. Gatherings of friends and family should be a time of celebration and enjoyment, not stress. The following is a general selection of wines that pair well with most dishes. The wines are light-bodied to medium-bodied. Whites: Pinot Grigio, Sauvignon Blanc, Riesling, Champagne and Sparkling wines. Roses: White Zinfandel, Blush and Rose.